There are two general methods for producing energy from manure: the use of heat and the use of bacteria. This page is focused on the use of heat – specifically, on relatively small thermal systems that can be used on a farm to produce energy from excess poultry litter or manure. In scientific terms, the use of heat to produce energy from manure is a thermochemical process. Thermal systems are well-suited for manure that is relatively dry, such as poultry litter, because there is less need to dry out the manure prior to processing. 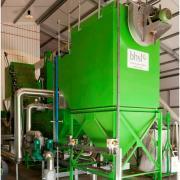 Thermal processes that can convert animal manure into fuel include pyrolysis, gasification, and combustion. 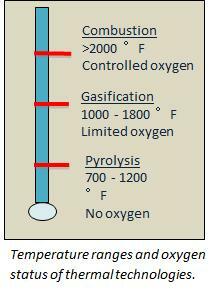 These processes differ with respect to temperature and oxygen concentrations, but each converts solid material into combustible, gaseous components, which then creates a hot flue gas. The flue gas is directed through a heat exchanger where heat is captured and moved through a distribution system for use in the poultry houses. Thermal processes also produce a range of potentially valuable co-products including liquid bio-oils, diesel fuel, and combustible gases. They also produce nutrient-dense products like ash and bio-charcoal (commonly referred to as “biochar”). The concentration of nutrients varies depending on the process, operating parameters, and system design. In thermal systems, almost all of the phosphorus and potash are conserved in the ash or biochar. While biochar retains some nitrogen associated with organic carbon, much of the nitrogen from these systems is lost in atmospheric emissions. Most is released to the atmosphere in the form of non-reactive nitrogen gas, or N2. Reactive forms of nitrogen may also be released, including oxides of nitrogen (NOx) and ammonia (NH3). The concentration of phosphorus in the ash or biochar provides a way to transport excess nutrients to phosphorus-deficient regions where the ash or biochar can be used as a fertilizer to replace inorganic, mined phosphorus. Reactive nitrogen, on the other hand, is largely lost from agricultural production. Biochar retains some nitrogen, while systems that produce ash (like gasification and combustion) generally convert almost all of the nitrogen to atmospheric emissions. Given that land application of poultry litter and manure can result in atmospheric emissions of far greater amounts of reactive nitrogen (from 50 to 90 percent of ammonia-nitrogen for surface-applied manure), well-designed thermal manure-to-energy systems can reduce overall atmospheric emissions of reactive nitrogen. Thermal manure-to-energy systems can help address nutrient imbalances in high-density animal production areas, but it is important to use clean technologies with low emissions in order to avoid transferring a surface and groundwater problem to the atmosphere. Technologies evaluated by the Farm Manure-to-Energy Initiative resulted in atmospheric reactive nitrogen emissions that were generally better than or, at the very least, similar to land application of poultry litter that is immediately incorporated, a strategy recommended to reduce ammonia emissions. However, the Farm Manure-to-Energy Initiative project identified particulate matter as a pollutant of concern for some thermal manure-to-energy technologies. At high temperatures typical of gasification and combustion, potash (which is abundant in poultry litter) volatilizes and can produce fine particulate matter in the form of potassium chloride or potassium sulfates. While some technologies have achieved low particulate matter emissions, others need additional work before they will be eligible for installation in states that set strict limits for particulate matter emissions. Depending on the location and the size of the installation, emissions of particulate matter and NOx are often a consideration for air permitting. Data on other criteria and hazardous air pollutants associated with the proposed technology may also be required. To learn more about air permitting associated with thermal energy production, see Start-Up Questions and Considerations. 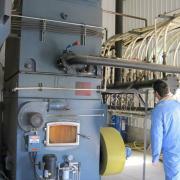 Thermal manure-to-energy systems, like the examples shown here, use heat to produce energy from manure. Thermal systems are adaptable to different scales, but the technologies vary widely in their design, effectiveness, and cost. Most are still in the early phases of commercial development, and many are still in the research and development phase. The Farm Manure-to-Energy Initiative conducted several case studies between 2012-2015 to document the performance of farm-scale systems in the Chesapeake region.